Climb Mont Blanc with a UIAGM/IFMGA qualified mountain guide. We offer guided Mt Blanc ascents for private groups and individuals. Each group booking with us will climb with their own private guides. Our goal is to give you a personal and qualitative experience, therefore we climb with a maximum of 2 persons per mountain guide during the whole Mt Blanc course. Mont Blanc is not technically a very difficult peak to climb, but still not to be underestimated. A safe ascent of Mt Blanc requires good acclimatisation and physical fitness, and an extensive knowledge of the conditions on this mountain. Together with our experienced Mt Blanc guides and a well prepared Mt Blanc program, chances for success are great on the highest mountain in the Alps. First our bodies must get used to altitude and less oxygen. Therefore we will climb several peaks before attempting to ascend Mt Blanc. Meanwhile we also get to practise the use of crampons and ice axe. 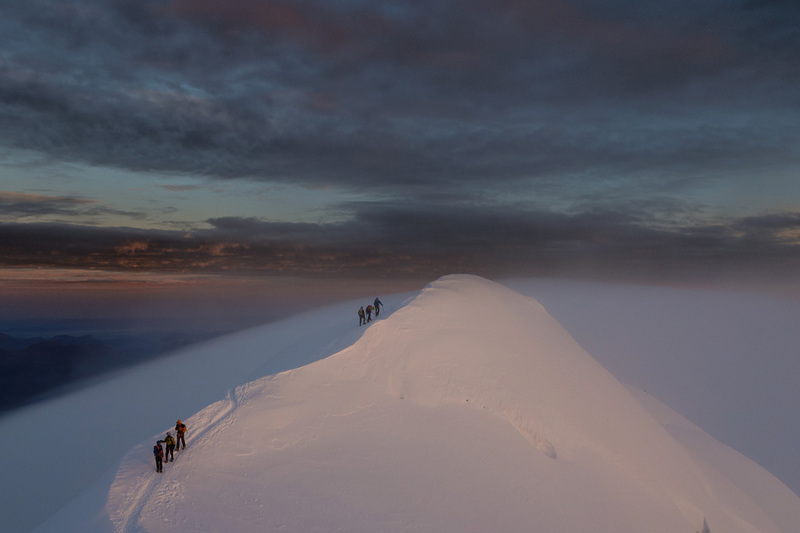 Depending on your former mountaineering experience and current aspirations we offer a 5- or a 6-day Mont Blanc course. Both programs will include enough time to recover before we ascend Mt Blanc. 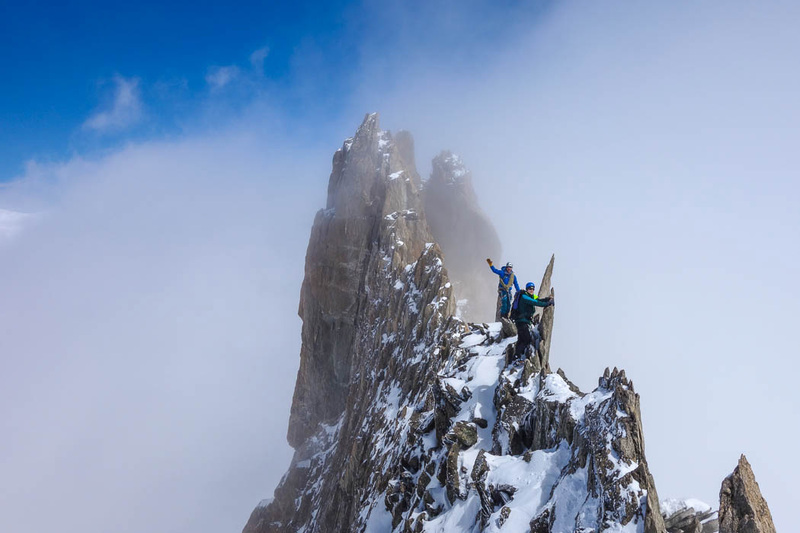 The goal is not to wear you out during our acclimatisation period but to climb nice peaks, acclimatize and enjoy the Chamonix mountain environment. Best time: Mid June to mid September. For us it is helpful to set a date as early as possible. Please send us an enquiry with your preferred dates. Ability: You need to be an experienced mountain walker with a good level of fitness. To get an idea of what to expect, please read the blog post How hard is it to climb Mt Blanc? Being a maximum of 2 clients per guide gives us the option to choose more technical climbs for acclimatisation, hence give you the ideal preperation to climb Mt Blanc. We will adjust our program individually to match your level of mountaineering and personal wishes. The following program is only a suggestion. There are countless number of climbs in the Chamonix mountain range that offer suitable training while our bodies get used to altitude. Day 0: Meeting with your guide in the evening, equipment check, briefing. Day 1: Crampon training, climb Petit Aiguille Vert (3200m), night in Chamonix. Day 2: Climb the traverse of the Aiguille d Entreves, night in the Cosmiques hut (3613m). Day 3: Cosmiques ridge on Aigille du Midi (3849m), night in Chamonix. For prices on group sizes not listed please contact us. Consult your personal equipment list for Mt Blanc ascents. The 6-day course have the advantage of doing 1 more climb for acclimatization and preparation, which makes it easier for you to reach Mt Blanc on the summit day. However, the main benefit is that we get the option to climb Mt Blanc a day earlier in case the weather should be unstable. We will keep the 1:2 guide:client ratio during the whole week, in order to be able to climb more fun, technical and spectacular peaks for preparation. Our guides enjoy getting to know their guests and we do not like to send guides for only the ascent of Mt Blanc. During the 6-day Mt Blanc course you have the possibility to improve and learn a lot about mountaineering. Our guides will teach you different techniques how to walk safely and economically with crampons and ice axe. The course is suitable even for beginner alpine climbers, if you are fit, adventurous, and like big challenges! Same as the 5-day program, but with day 4-6 reserved for climbing Mt Blanc. During the last 3 days we will spend 2 days climbing Mt Blanc and on the “extra weather day” we will do either another route for acclimatisation, or any interesting climb of your preference. This could be a rock climb in les Aiguilles Rouges or an ice/mixed route in high altitude. Good technical preparation, acclimatisation, and mountain guides that are well experienced ascending Mont Blanc with clients, are the ways to success! More reading about Mont Blanc ascents, guest testimonials, and other useful information in the Chamonix Mountaineering blog category.